We are located in Houston, Texas, near Beltway 8 and Highway 288, south of NRG Stadium and the Medical Center. 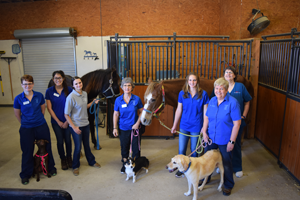 The clinic provides veterinary chiropractic, acupuncture, and rehabilitation services for dogs, cats and horses. Aquatherapy is performed using the Aquapaws Underwater Treadmill for dogs and cats and the Aquapacer for horses. ​​Dr Robinett is certified in veterinary chiropractic by the American College of Veterinary Chiropractic and veterinary acupuncture by the Chi Institute. Dr. Robin Robinett grew up in the Houston area and she graduated from Pasadena Dobie High School. She has a Bachelor of Science Degree from Texas A&M in Biology. She returned to Houston and worked at M.D. Anderson Cancer Center for two years before resuming her education. 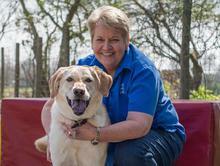 She graduated in 1989 from Texas A&M College of Veterinary Medicine. Robin showed horses in hunter shows while in high school and in college began showing in dressage and combined training/eventing. 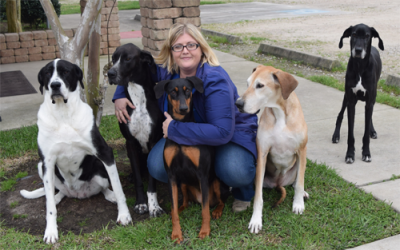 After graduating from veterinary college, Dr. Robinett worked for the Houston SPCA for a year and then helped to open a clinic in Pearland. She left that practice in 1997 and did relief work and started a mobile practice in veterinary chiropractic. She received her certification by the American Veterinary Chiropractic Association in September 1996. She took the Chi Institute mixed animal acupuncture course in 2007 and received her certification in February 2009. She has also taken the Chi Institute's Chinese Food Therapy course and is currently taking the Chinese herbal medicine certification course online. Dr. Robinett's new clinic Veterinary Chiropractic and Rehabilitation Clinic, PC. opened in October 2008 and is the culmination of her long time goals and dreams. With the new equipment and added therapeutic modalities, she can now offer more help for her patients and clients. Dr. Robinett is certified in Equine Rehabilitation. 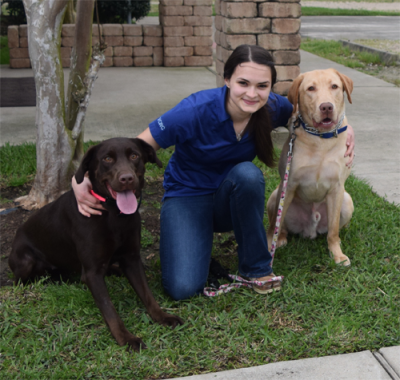 She will also be working towards her goal of becoming a Board Certified specialist in Sports Medicine and Rehabilitation, a newly recognized specialty in veterinary medicine. Dr. Robinett is a member of the American Veterinary Medical Association (AVMA), Texas Veterinary Medical Association (TVMA), American Association of Equine Veterinarians (AAEP), American Veterinary Chiropractic Association (AVCA), Harris County Veterinary Medical Association (HVCMA), American Association of Rehabilitation Veterinarians (AARV), and the Texas Equine Veterinary Association (TEVA). Dr. Anna Costin grew up in North Carolina, then came down south after receiving her bachelor degree in Animal Science from Virginia Tech in 2012. She then attended Louisiana State University School of Veterinary Medicine. She became interested in integrative medicine during vet school, where she witnessed first hand the benefits animals gain during treatment. After completing her DVM in 2016, she attended the Chi Institute of Traditional Chinese Veterinary Medicine and received her certification as a Mixed Animal Veterinary Acupuncturist in 2017. 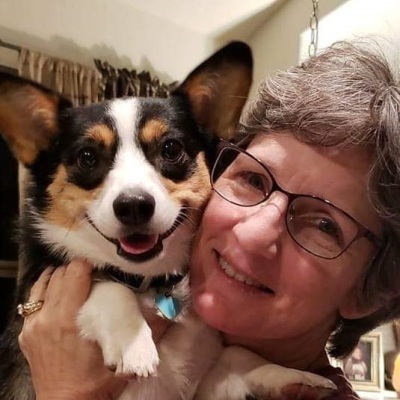 She completed her certification in Veterinary Spinal Manipulative Therapy in 2018 from the Healing Oasis Wellness Center. In her free time she enjoys riding horses, as well as spending time with her wonderful husband and dogs. She is extremely passionate about her work and is excited to help each and every patient! During her time in Oklahoma, Dr. Dundas was exposed to the western performance horse world and greatly enjoyed learning about this discipline. Dr. Dundas also acquired a young Quarter Horse, Charlie, and started him while finishing veterinary school. She married her Texan husband in 2016 and they are active in Doberman rescue of North Texas and Great Dane rescue of North Texas. They have 4 Great Danes and 1 Doberman. They also added another QH gelding to the herd, Stanley, and they enjoy trail riding together. In 2018 she decided to branch out into doing small animal relief work while taking her animal chiropractic (Parker University) and acupuncture certification (IVAS) courses. She moved to Houston and began working at VCRC in January 2019. Jerri was born in Galveston, Texas and attended grade school at Our Lady of Guadalupe, junior high school at O’Connell High School and graduated from Ball High School in 1980. Growing up, her family always had a dog and a cat, and as an adult she can’t remember NOT having an animal companion. She now has 2 dogs and 1 cat. She knew from an early age how much she loved animals. She started playing softball when she was 7 because her Grandmother coached a girl’s softball team. She ended up playing softball well into her early thirty’s. She started working construction on the ship channel in 1989. She attended San Jacinto College and received her certification in Occupational Safety & Health Technology in 1999. For 20 years, she worked as a Safety Manager in the oil and gas industry. Then in 2002, she met Dr Robinett and they spoke about opening an animal rehabilitation facility. 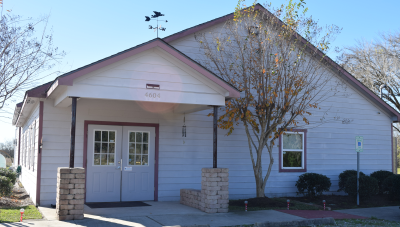 In 2008, Veterinary Chiropractic and Rehabilitation Clinic opened. In 2009 she was happy to become a part of the office staff helping to take care of all the wonderful animals that need our services. Donnette was born and raised in Pearland, Texas and is a graduate of Dawson High School. She has been volunteering with the STARS Girl Scout horse camp since 2003, teaching young girls how to ride and be safe around horses. 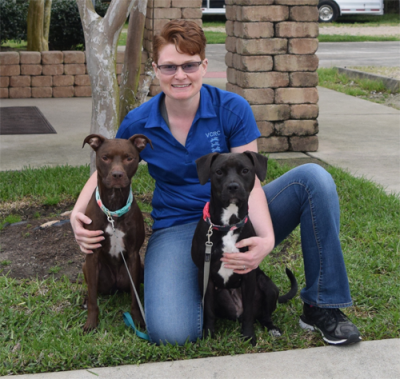 Donnette has always loved animals and wanted a career focused on helping them. Donnette graduated from Vet Tech Institute in 2012. She currently has two rescue cats, Jester and Chaplin. Along with her three rescue dogs, Daisy, Wendy, and Rosey, her evenings are very entertaining. She is glad to be a part of such a caring team. Esther grew up in Friendswood, TX most of her life and graduated from Friendswood High School in 2015. She has always had a love for animals and started volunteering for Noah’s Ark Bayou Sanctuary dog rescue at 8 years old till she was in high school. In high school she was very involved in FFA where she participated as an officer for two years while raising and showing lambs all 4 years. As she attends school, she is planning to study physical therapy as she is gaining knowledge in rehab while working with animals here at VCRC. Esther currently has a chocolate lab named Macy and a yellow lab named Mylo who enjoy coming to work with their mom. She also has a cat named Moxy who she rescued at the end of 2018. She has enjoyed working at VCRC since 2017 and hopes to continue to learn and grow from this opportunity. Sharon moved to Houston in 2004. She has always had a love for animals and decided to become a vet when she was 8 years old. Her first patients were the strays that some how made their way to her porch and of course her family dogs. In high school, she raised sheep and goats in FFA and then went to Texas A&M University to continue her dream of being a vet. During her senior year she decided that she would like to pursue the physical therapy and rehabilitation side of veterinary medicine. After graduating in August of 2018, she found her way here to VCRC and believes this will give her the opportunity to see what her future holds. Sharon has 1 dog, named Mr. Pickles, that she rescued from the flash flood in December, and a cat named Sugar. Leslie went to Pearland High School and was apart of the basketball team that went to State in 1980. She graduated from University of Houston with an Accounting degree. Her first job was as a Financial Analyst with a contractor to NASA, then a Software Developer for Hewlett-Packard. Over the last couple of years, she decided to follow her dream of working with animals. 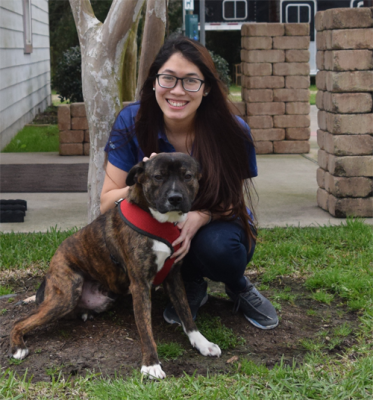 She began by volunteering with the Pearland Animal Shelter as part of their Petco Adoption events. 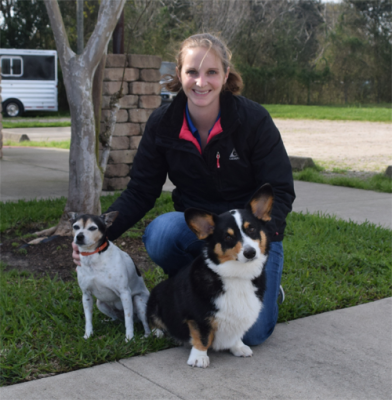 In pursuit of making a career change, she went back to school and completed the Veterinary Assistant program at Alvin Community College. She believes in a more holistic approach to medicine for herself and her dogs and jumped at the chance to work at VCRC. She started working at VCRC Dec 2018 and it's been an incredible learning experience. 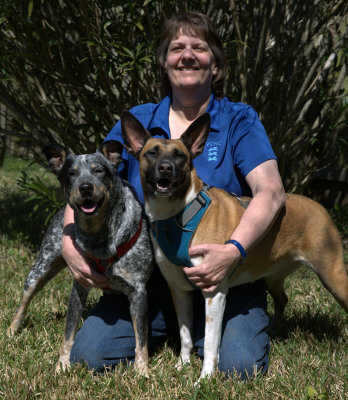 She has two dogs, Kizzie and Huckleberry, that she adopted from the Galveston County Animal Shelter. She enjoys all kinds of activities with them, but especiallly hiking.